Climatic experts have long been insisting that global warming is inevitable, and in the next few years we are likely to see changes in our weather – but I didn’t think they meant immediately! Kate and I have been really up against it this month for various reasons; I’ve spent time out of the garden and her cats have been in labour, but the main challenge has been the weather. We’re finding that our seeds are germinating in no time, plants need potting on the minute your back’s turned – and then there’s the question of watering. It’s only April but already we’ve had to set up watering aids in the greenhouse, and we’re busily measuring up for irrigation systems for the outdoor beds. Although not quite as popular as chips in my book, the various plants which belong to the brassica family are real Kitchen Garden favourites. Wrapping up warm before venturing out to harvest fresh brussel sprouts on Christmas morning might be just a romantic dream – especially so on a sweltering afternoon in April! But with a bit of hard work and dedication – after all, there’s plenty of time for things to go wrong and pests to get to work – the brassica dream can come true! I’m constantly reminded that I’ve never managed to produce a decent cauliflower crop in the two Kitchen Garden growing seasons, so this year I’ve come up with a foolproof plan – let Kate take charge! Already she’s sown the seeds, potted on and hardened off the seedlings and the healthy young plants are looking very good indeed. She’s taken precautions against aerial attack by using the Freestanding Heavy Duty Steel Vegetable Cage, complete with the 7mm mesh Butterfly Netting, and there’ll be no subterranean sabotage from the cabbage root fly as the cabbage collars are also in place. And here’s a good tip – use two collars for extra protection, positioning them so the pre-cut slits are covered! I’ll make sure you’re kept up to date with the progress of Kate’s cauliflowers throughout the summer! Much as I’d like to spend my entire week in the Kitchen Garden – and fellow gardeners will surely agree that there’s plenty to keep you permanently occupied at this time of year – occasionally I hit the road to visit other gardens and take part in exhibitions, etc. April 11th saw the Royal Horticultural Society’s gardens at Harlow Carr, on the outskirts of Harrogate in North Yorkshire, host the second in a season long series of Kitchen Garden Growing and Sowing events, and I was delighted to attend - along with one of our Superior Timber Raised beds and some of the new style caravan crop protection hoops. 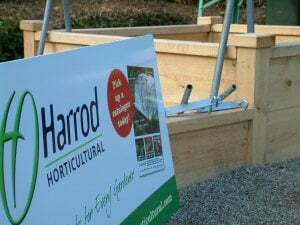 A glorious spring day saw a well organised event attract nearly 2,000 paying customers, many of whom paid more than a passing interest in the Harrod Horticultural products. Also full of praise for the range of Sneeboer tools were some of the Harlow Carr staff, with Senior Supervisor Garden and Technical Services (surely the longest job title in horticulture!) Lizzie Balmforth describing the short fat trowel as her “right hand”. Incidentally, a big thank you to the Harlow Carr team and Lizzie in particular, who kept me well stocked with tea and – more importantly – biscuits! You can find a full report on my trip to Harlow Carr, and the idea behind the Kitchen Garden Growing and Sowing events, on our Garden Forum, regularly updated and increasing in popularity. 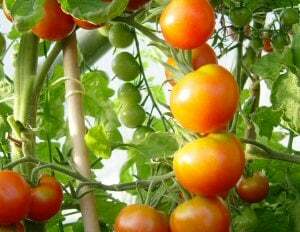 Luckily not, but only because I’ve been using the new tomato support and watering systems from our catalogue! You might remember that I started off my toms just after Christmas, mainly because I wanted some more mature plants for display on our stand at the RHS Chelsea Flower Show next month, and the excess plants were set out in the greenhouse border at the Kitchen Garden. They’re absolutely loving the warm, sunny conditions but need constant supervision – and that’s where the Easy to Grow Kit and the Self-Watering Tomato Tower come in. The kit has a whopping 47 litre capacity, meaning plants certainly won’t go thirsty, whilst the tower has a reservoir built-in to the pot and an ingenious riser and support ring system to keep your plants heading skywards. Due to the quantity of the plants I’m producing for Chelsea, space in the greenhouse is at a premium so any help is gladly received. I’ve also been side-shooting and tying in the tomatoes where necessary – hopefully, the reward for all this care and attention will be a bumper crop! 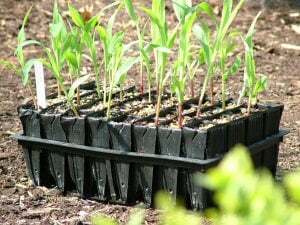 You might remember from my last e-mail update (subscribe at the top of the page if you didn’t receive a copy) that Kate and I were planning to continue seed sowing and potting on plants where required. We’re just about managing to keep up, and we’ve also grown some of the runner bean plants up a willow obelisk to create a display for the Harrod Horticultural stand at Chelsea - they “look fantastic” (not my words, but those of Head Gardener Dave, a totally independent witness!). The companion plants are all growing well and we’re hoping to create some ‘Companion Pots’, all planted up with the pest-busting phacelia, marigolds and nasturtium we’ve carefully grown. 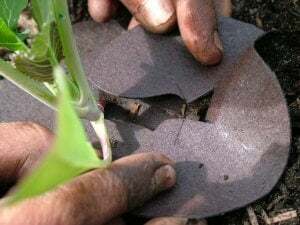 The sweetcorn seeds have germinated in their rootrainers – they’ll be going out shortly – and Kate’s got ambitious plans to grow a quick crop of lettuce in the potato bed before the spuds leaf up. What with keeping a finger firmly on the pulse of the horticultural world and publishing articles on the Garden Forum you could say it’s been a busy month! Also keeping busy is Head Gardener Dave, who tends the formal gardens surrounding the Kitchen Garden. He’s spent a good part of the last month walking along behind his mower – occasionally producing straight lines! – and feeding the lawns, but his plan to relax and admire his daffodils was out off the mark, as he’s spent most of the time dead-heading them! If this has whetted your appetite, don’t forget to visit the completely revamped Harrod Horticultural weblog, accessible from the Garden Forum link on this page, and enjoy reading the articles we’ve published. We’re posting a mix of gardening news, information, opinion and anything else that takes our fancy and it’s proving a popular destination. You can even post a comment of your own, especially if you’ve got some good gardening tips or can relate to some of the articles we’ve written. We’ve got news, information and lots more – the Garden Forum is certainly the place to visit!